This dress was purchased from House of Brides Couture in Chicago, IL. It has beautiful lace detail with jewels and a long train. There are 6 bustle points to pick up the beautiful long train. 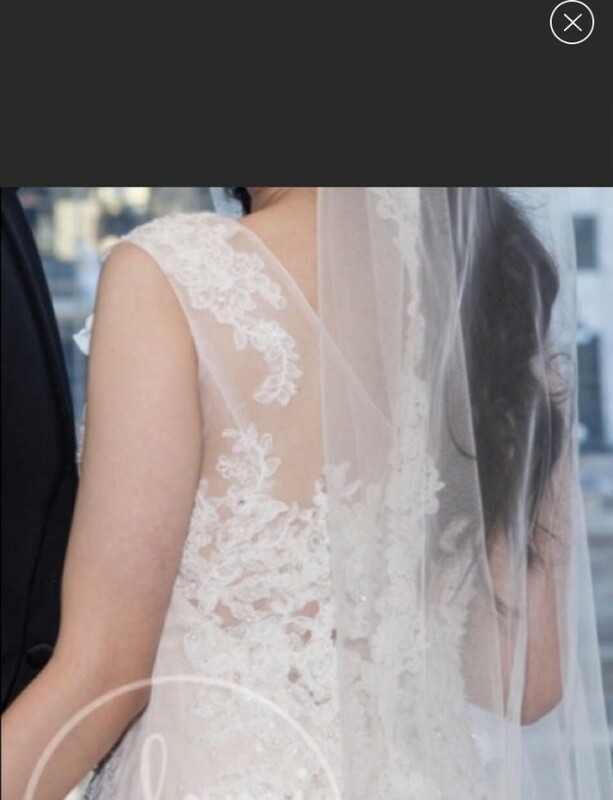 It has lace and jewels on the front of the dress and all along the back. It has a sheer back and V neck front.It has a champagne underlay, which can be removed if preferred and the dress is Ivory. Please send a message if you have questions or want more information! The dress was taken in to a fit a size 2-4, and shortened to be floor length with my heels on (I am 5'2 and wore 4 inch heels at my wedding). There is also added lace applicable to the back to cover some of the sheerness (needed to be church appropriate). It has double cups in each breast pocket, but can easily be removed. Once you send a message, Reneh can invite you to purchase the dress.